Rimonabant is a potent CB1R inverse agonist demonstrating significant anti-obesity and anti-addiction effects, as well as calorie restriction mimetic (CRM) anti-aging capacities. Research Indications: Anti-obesity, Anti-aging, and Anti-addiction (smoking cessation, et al.) research. 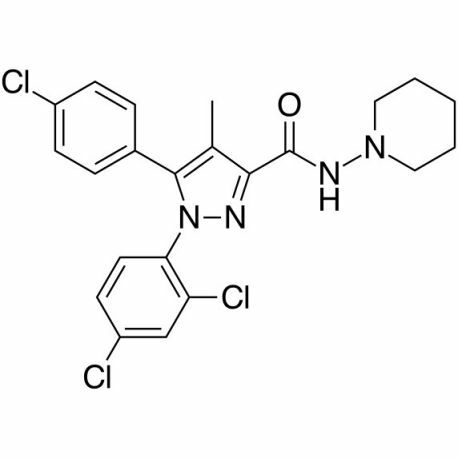 Rimonabant (also known as SR141716; trade name Acomplia) is an anorectic antiobesity drug acting as an inverse agonist at the cannabinergic CB1 receptor which as well displays anti-addiction properties. 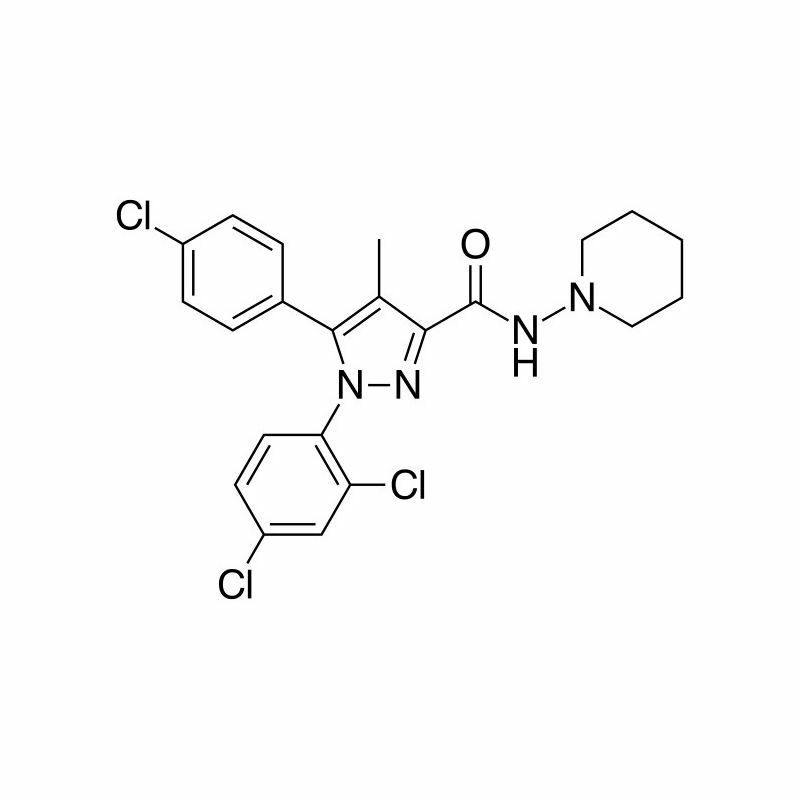 Rimonabant is a potent Cannibinoid-1-Receptor (CB1R) ligand used in a variety of medical and scientific applications. 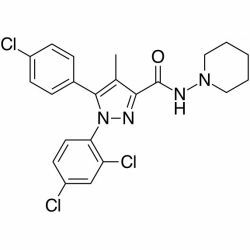 Specifically it is a potent CB1 Antagonist/Inverse Agonist. It is orally active and the first agent in this class to demonstrate such selectivity. It also crosses the blood-brain-barrier very well and hits CNS receptors with a high rate of binding; displaying low nanomolar affinity for central sites(1). Rimonabant has shown robust reductions in body fat mass and appetite; and as such is further characterized soon-after approval as an anorectic anti-obesity drug(2)(3), in which it's major clinical use began. The compound further was studied based on it's CNS effects for anti-addictive potential; including in cocaine craving and withdrawal(4), but even more so, for smoking cessation and in the context of nicotine withdrawal(5)(6). Other potential uses investigated and studied with rimonabant are the improvement of short-term memory and / or the blockade of THC-related impairment of short-term-memory(7). CB1 Receptors are negatively coupled to adenylate cyclase; as a result, when activated, they metabatropically inhibit neurotransmitter release as well as cortisol and ACTH secretion(8)(9)(10)(11). The appetite suppressant effects of Rimonabant are the result of direct hypothalamic actions and as well the large increases in noradrenaline and serotonin resultant from central cannibinoid receptor 1 blockade(12)(13)(14). Additionally, rimonabant may make sweet foods less palatable and decrease the food-reward behavioral response(15), of course, having opposite effectsof THC in many ways (including chemically), would further reinforce this paradigm. Rimonabant also acts directly in fat cells and decreasing their synthesis, thereby extending it's weight loss potentials(16). As the second messenger cyclic adenosine monophosphate (cAMP) has a very broad distribution throughout much of every cell in the body and in the nervous system...the additional effects of Rimonbant in increasing energy expenditure (17)would likely be via this route; CB1 receptors being primarily negatively coupled to adenylate cyclase would maintain this assertion(18). Thus rimonabant can be seen as a receptor-based-adenylate cyclase stimulator or cAMP secretagogue(19). Rimonabant is also shown to improve insulin sensitivity thereby leading to stable blood sugar levels and from this facet , the resulting weight loss or weight stabilization(20)(21).Thus , Rimonabant can technically be classified as a multi-modal weight loss agent and an ideal candidate for weight loss especially in circumstances where other medications have failed or to where the hypothalamus/pituitary appears to be malfunctional or under-active in the patient. Effects at the mu-Opioid receptor may also underlie some of Rimonabant's effects on appetite and on energy expenditure, as it appears to be a strong property and a shared interaction with some of the 'later' CB1 ligands(22). Mu-Opioid receptors are proven to play a huge role in hypothalamic function and in the release of neurotransmitters centrally(23). Given the similarity in mu-opioid and CB1 receptors (they both functionally inhibit cAMP production) - this would be a plausible hypothesis in the overall therapeutic effects of Rimonabant and on it's extravagant cAMP boosting effects. To further reiterate this effect; take the rimonabant-forskolin excerpt from this study - the rationalesection elucidates this effect and also correlates (but doesn't confine) it to the prefrontal cortex and cerebellum; further re-confirming it's central effect on the second messenger concentration. Additionally, in studies with the SSRI fluoxetine, it shows there is a direct serotonin-cannibinoid interaction and also demonstrates the CB1 inhibition of adenylate cyclase in overall CNS activity is an essential prospect in the study of depression and other mental disorders. Rimonabant has also been shown to have some GABA-ergic activity (potentiation), which may contribute to it's overall therapeutic effect on satiety and on lipogenic circumstances(24)(25). Rimonabant can reverse slowed-intestinal transit caused by THC- and thus potentially alleviate constipation and other bowel issues associated with use of agonists to the CB1R's(26)(27)(28). On the flip side however, it may produce anxiety-related gastrointestinal pathology in sensitive individuals and may be counter-productive in those with an existing gastrointestinal disorder that is highlighted by diarrhea(29)(30). These effects however are fairly rare occurrences within the majority of users of Rimonabant. Rimonabant notably has the ability to increase male fertility by increasing spermatogenesis in the human male and sperm motility(see here). Rimonabant has been shown to improve anxiety and hostility in patients with schizophrenia according to a huge statistical analysis and double-blind placebo controlled study conducted in 2011 (31). Accordingly, schizophrenics have been shown to have an altered (increased) CB1 receptor density in multiple brain regions, thus producing more than just psychological effects but also contributing to a schizophrenics overall quality of life(32). Of notability, Rimonabant may be the only publicly available compound that has been shown to specifically reduce the craving for chocolate and it's reinforcing properties; mainly but not solely concerning the flavor/palatibility(33)(34). CB1 receptors seem to play a huge role in forming accumbal encoding and thus [promote] dopamine release in the nucleus accumbens. CB1 receptor activation is essential for addiction and reward related behavior.(38). Despite all of this , CB1 activation may be ideal in some conditions characterized by lack of motivation to reward, in contrast, antagonism doesn't necessarily reduce motivation per se, and in normal persons side-effects such as depression can occur as a result of both agonists and antagonists - but are not very common(!)(!). The benefits of Rimonabant can be concluded as. Rimonabant can improve Insulin Sensitivity and can increase fat loss. Rimonabant may help avert cue-related cocaine reinstatement. Rimonabant is a superb smoking cessation aid. Rimonabant may help antagonize Cannibinoid-related responses. Rimonabant may potentiate GABA-A and many other neurotransmitters. Rimonabant provides robust increases in cyclic AMP (cAMP) and enhances Forskolin's effects by amplifying cAMP increases. Rimonabant increases spermatogenesis and sperm motility. Rimonabant can alleviate constipation induced by THC and other agonists of the CB1 receptor. Rimonabant blocks THC-related impairment of short-term memory and may promote memory acquisition/retention in general . Rimonabant specifically may also improve spatial memory, object recognition and social short-term memory; may have significant application in neurodegenerative disorders.